Following on from my epicly long post introducing Lacquerdaisical's thermal polishes here, today I am sharing their awesome glow in the dark, textured polish - Violets Solves Everything. Yes, you read that right, glow in the dark, and textured. AND purple. AND awesome! Violets Solves Everything is a purple textured polish with violet shimmer that almost gives it a metallic sheen. The finish is gritty but not rough - I find some textured polish seems a bit too scratchy but this isn't the case here. Of course, if you're not a texture fan a couple of coats of topcoat smooths it all out, but I chose to wear it plain. The glow in the dark aspect works best if you charge it in sunlight or under a black light - seeing as this is England and January sunlight wasn't an option, but I did have a brainwave and used my LED gel lamp to "charge" it, and almost blinded myself! I wasn't expecting it to glow quite so much! The glow lasted a good five minutes after charging just for a few seconds and is easily the brightest glow in the dark polish I've ever tried. The texture of this was fairly thick, but as long as you leave a little extra drying time in between coats you shouldn't have a problem and it doesn't take long to dry, like most textured polish. I think this is a really unique polish in the indie scene, and I've not seen anything else remotely like it! 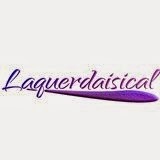 Lacquerdaisical polishes are available to purchase in the UK from their Facebook page for just £2.50 for 5ml or £6 for 15. Bargain!